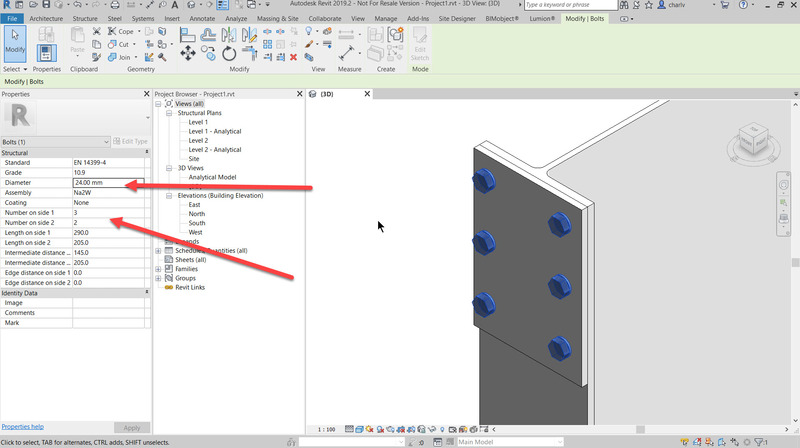 I have recently been asked on how to add bolts in Revit. 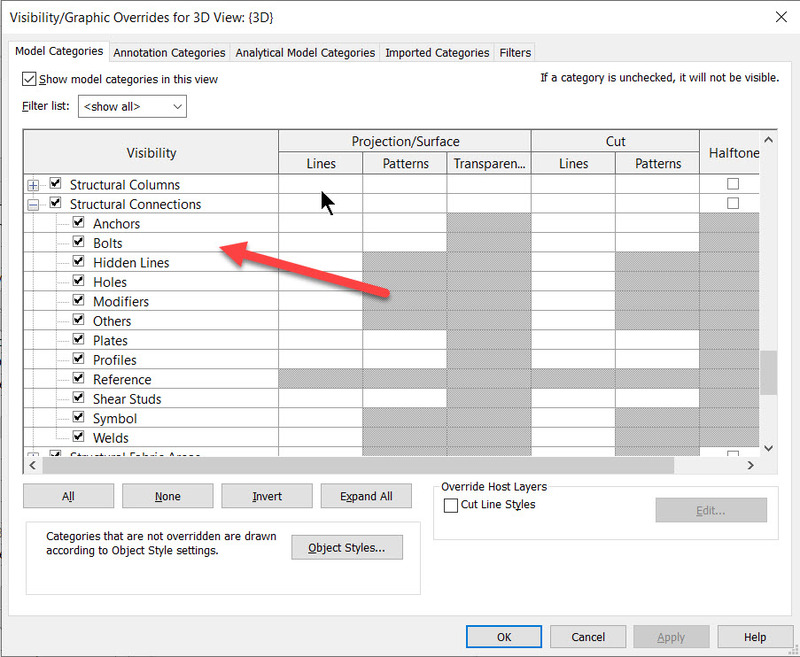 Since Revit 2019 a new set of structural detailing tools have been added to Revit under a new Steel ribbon. One of the tools is the creation of bolts. 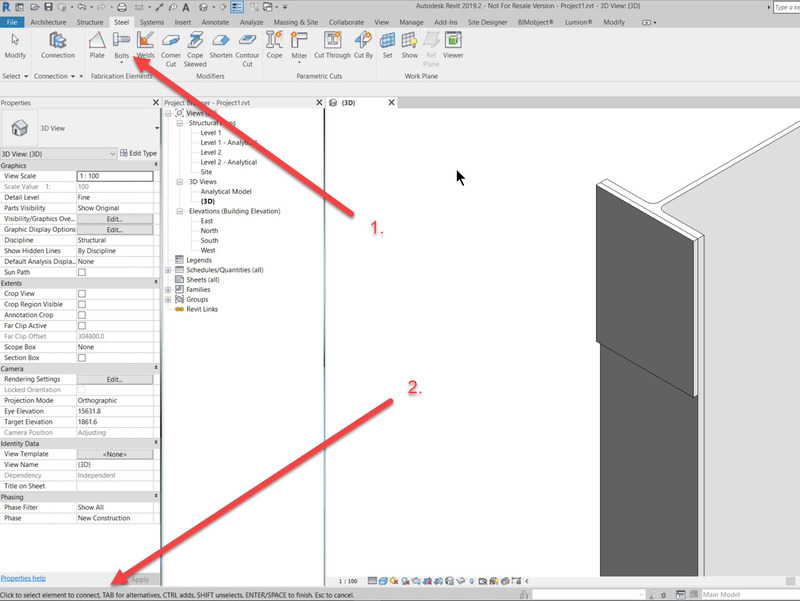 Once you have opened a new drawing go to the Structure Ribbon and insert a steel column to the drawing as below. Once you have added the column the next step is to add a second object. 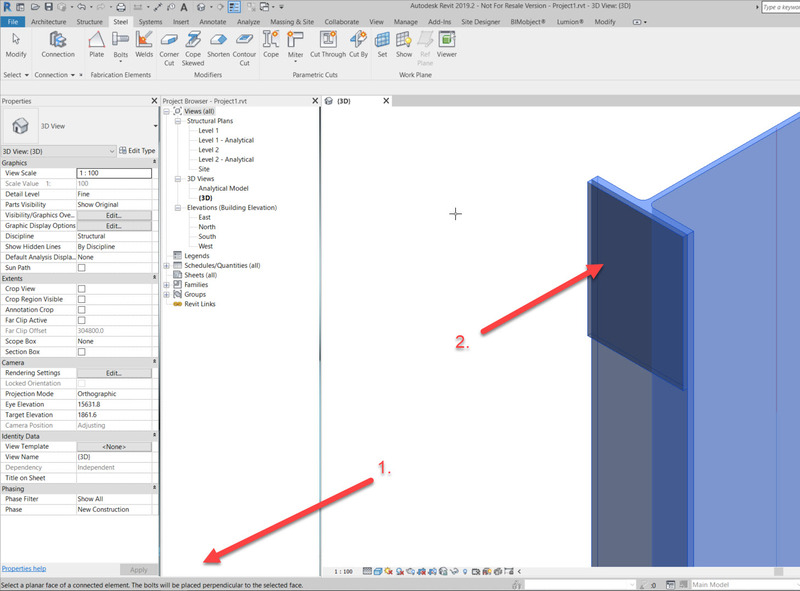 In this example I’ll be adding a rectangular flange or plate to the side of the vertical side of the column as shown below. To do this go to the Steel Tab on the ribbon and click on the Plate tool. 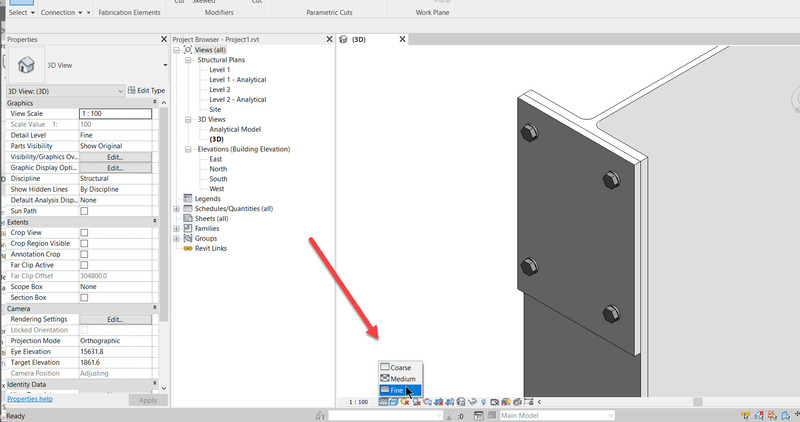 Once you have done so select the “Set Work Plane” option to change which plane you would create the object. Then select the “Pick a Plane” option. Click OK and then select the side of the Column. Once you have selected the side of the column this will form the new work place. You then select the rectangle option and draw a rectangle over the side of the column as shown. Click finish on the ribbon. Now that you have the flange and the column we can continue adding the bolts. 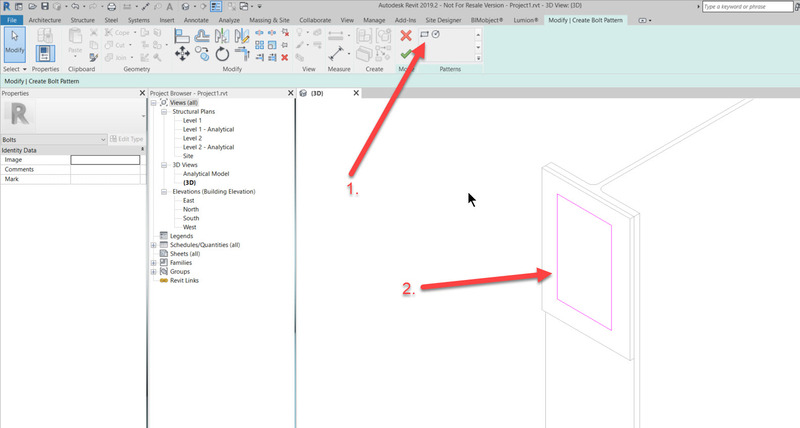 Click on the Bolts button on the ribbon and read the required selection method at the bottom of the Revit screen. So hold the Ctrl key and select both the column and the plate. Then press space or Enter to finish the selection. Now read at the bottom for the next step, which is selecting the face of the plate. Once you have selected the face the next step is initialized. The next step is to draw either a rectangle or circle on the face where you want to place the bolts. I have drawn a rectangle as shown. Click Finish. Once you have clicked Finish to process is complete and you’ll see the bolts appear. If the bolts do not appear you should check if the Bolts sub category under Structural Connections is turned on. You can access this dialogue box by typing a shortcut: VG. Also make sure you have set the View Detail Level to ‘Fine’. You will also be able to changes setting like the size and number of bolts per size for instance. 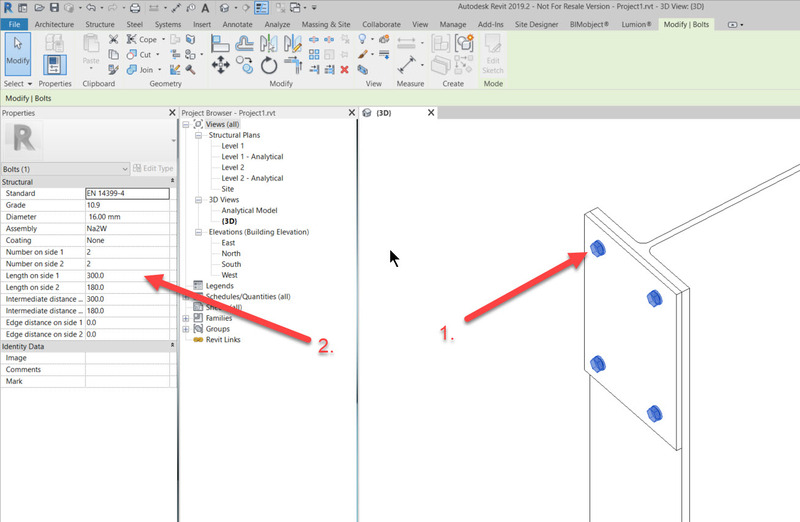 Autodesk has steadily increased the steel detailing features of Revit and in this release, they have done great work. You can visit Micrographics at www.mgfx.co.za to find out more on Revit and Revit Structural courses to learn more on how to do Steel detailing with Revit.